Materials of this chapter were published in the books 'Biological product Albit for yield increase and plant protection: trials, recommendations, results of application' edited by member of the Academy V.G. Mineev. All-Russian Scientific Research Institute of Plant Protection, Ministry of Agriculture of the Russian Federation, 2009, and 'Biostimulant Albit for increasing of yield and protection of crops,' A.K. Zlotnikov, edited by Prof. А. Mel’kumova. All-Russia Institute of Plant Protection, Russia, 2006. Galega (Galega orientalis Lam.) is very prospective fodder crop. It belongs to family Fabaceae, genus Galega (Galega L.). There are 8 species in the genus. In Russia, this plant is known as Rutevka, Galega, Goat Ruta, Forest Solodyanka. There are two species of galega. In the forest zone of the Caucasus: G. orientalis Lam. and G. officinalis L. They are used for animal feeding. G. orientalis Lam. is more valuable, because it does not contain alkaloids like G. officinalis L.
According to data of the Timiryazev Agricultural Academy, the most effective method for using of galega is 2-3-fold mowing at the budding stage or 2-fold mowing at the flowering stage. Alternation of mowing and seed usage each 1-2 years allows to restore herbage and prolongate its productive longevity. G. orientalis Lam. gives the earliest spring food for livestock, while clover and alfalfa only begin to intensive grow. A long-term vegetation, possibility for using of herbage until late autumn, good regrowth, a high energy of sprout generation – all this make galega indispensable for usage in green conveyor. A high productivity of galega is combined with a high nutritional value: there are 20-21 fodder units in 100 kg of green mass, 57-58 fodder units in 100 kg of hay, in the aboveground part of plants – 16-25% of protein content. 1 fodder unit has 175-216 g of raw protein. Nowadays, problem of livestock feed with a high protein content is still actual. Traditional leguminous crops such as alfalfa and clover, unfortunately, are prone to thinning, and after 3-4 years of usage, their productivity is significantly reduced. At the same time, fields with galega can be used for 10-15 years without thinning, since necessary plant density is ensured due to root suckers. So, galega plants can displaces all other plant species, especially weeds. Studies of the All-Russia Research Institute of Vegetable Breeding and Seed Production have shown that conditions in the most agricultural areas of Russia are favorable for cultivation of galega in the Non-Chernozem Zone, Volga-Vyatka and Ural regions, Western and Eastern Siberia, Far East and North Caucasus. In recent years, this crop is increasingly being used in countries of European Union, foreign Asia and North America. 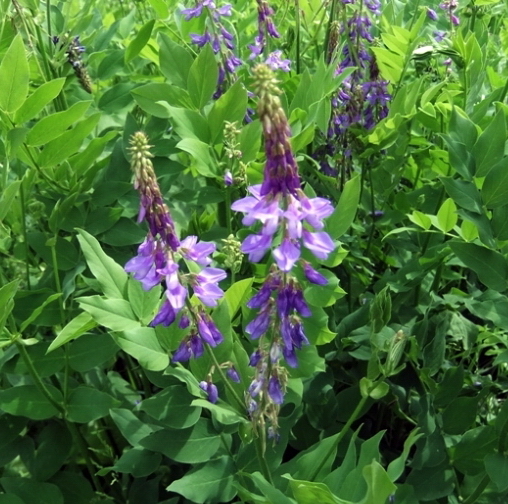 Galega grows in the same areas as clover and alfalfa. In connection with recent events in Russia, a lot of empty arable lands appeared in our country. Also, lack of organic and mineral fertilizers leads to decreasing the soil fertility. The high price of combined feed for livestock leads to a rise in price of livestock products. At the same time, the cultivation of galega allows to have a long-term functioning pastures for livestock. Currently, the number of protectants for galega is extremely limited in comparison with other crops: two plant growth regulators and no fungicide are registered on galega in Russia. Albit is one of few product registered in Russia. It has a high efficacy as a plant growth regulator of galega. Albit increases the field germination, activates growth and development, accelerates regrowth after mowing, increases plant resistance to unfavorable conditions of environment, provides the defense against plant diseases, increases the green mass yield, improves the product quality. Application recommendations. It is recommended presowing seed treatment (70 mL/t) and one fold foliar spraying at the budding stage (BBCH 30-50, 40 mL/hа). To enhance regrowth after mowing, Albit may be applied for spraying for 7 days after mowing. On galega, Albit has been tested since 2001 in field trials in Vladimir (Fig. 1), Moscow and other regions of Russia. 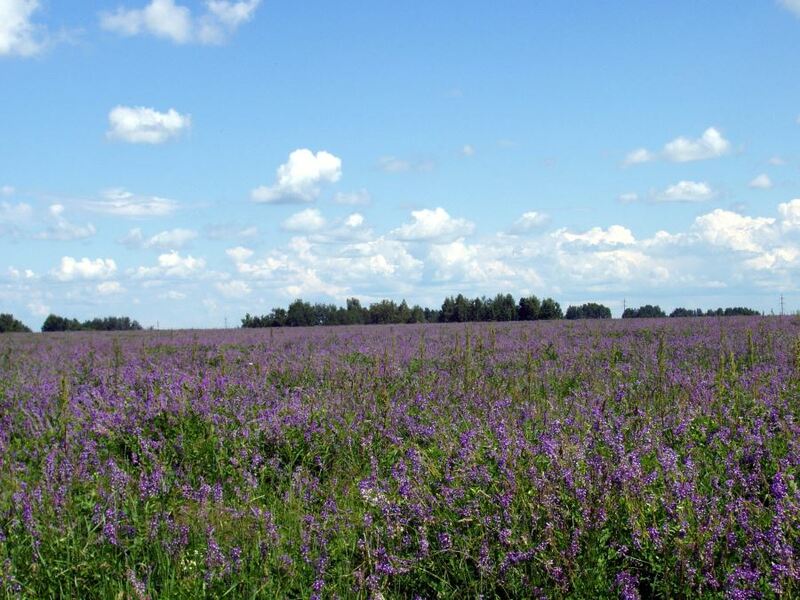 Field trials were conducted in All-Russia Institute of Plant Protection, Vladimir Plant Protection Station, and also in other institutes and farms. According to results of field trials, treatment of galega with Albit increased yield of green mass by 3.43 t/ha (21.7%), increased yield of seeds by 0.04 t/ha (16.2%). Presowing seed treatment with Albit increased germination of galega seeds by 8–13%, height of plants by 5–10 cm, plant density by 10%, increased regrowth of plants after mowing by 14.1–34%. The treatment with Albit allows to significantly increase the productivity of old-growth galega plants (data of Vladimir Plant Protection Station, 2004). allows to significantly increase the productivity of old-growth galega plants.